Our 3 bedroom/2.5 bathroom/2 car garage newly remodeled home is ready for your stay! 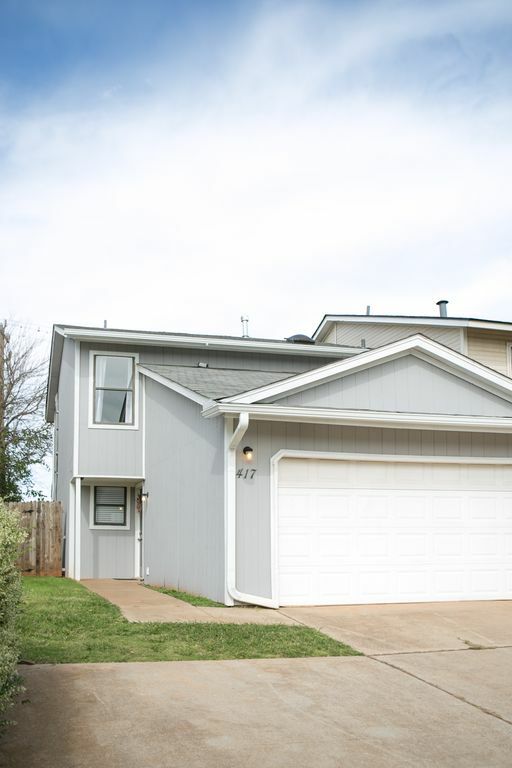 Minutes from Top Golf, Silverhorn Golf Course, iFly, Zoo, Remington Park Casino and Racetrack, Downtown, and Bricktown. Quiet neighborhood within a short drive of almost everything in the city because it is located off one of the major highways. We've got you covered with high speed internet, new mattresses and bedding, shiny new appliances. We have an iron, ironing board, hangers and did we mention it is mostly all new? We also have a few games, hair dryer, and a few toys. Also, enjoy free private parking right in front of the house in the garage and driveway. If you want access to the third bedroom, you need to make your reservation for 5 people at least, even if you won't have that many. We then provide you with the code to a lock box that you may access the key to the third room with. We've got you covered with HD Smart TV, high speed WIFI, local channels and free Netflix etc. Our DirectTV subscription is logged into Itv apps like ABC, ESPN, PBS, History Channel, TNT, CBS, and more for live tv and on demand shows! We send you an access code at check in time to access the key. If you have any questions or needs, just ask and we are happy to help! You probably won't hear from us unless you need us! Modest but clean and quiet neighborhood. We loved this place! It felt like home. We had everything we needed. It was very clean and comfy. I had a question about the ac unit and they came out that day to check it out. I have a large family 4 adults and 4 kids and we never felt crowded. I will definitely book this property next time I am in Oklahoma. It is close to everything. Thank you! My family and I booked a conveniently located place that was central to all of us. The home was perfect for our growing group and even accommodated 3 younger children with some pretty cold weather outside. There were a few games and a limited toy selection so fortunately it was Christmas and the kids had plenty to play with. The neighborhood was quiet and peaceful and conveniently close to anything shopping we needed. The homeowner/manager and staff were great to work with and quick to respond to any questions we had. Overall, one of the best Christmas experiences we have had since the kids grew up and started families of their own. It brings me so much joy to know that our home was able to host such a joyous Christmas occasion for you. You were fantastic guests! would be quite reasonable for 6 adults or 4 adults and 4 kids. calling a blow-up mattress a viable bed doesn't quite qualify for another 2. would do better to claim for 6 adults and invite 6 others to bring sleeping bags for a nominal fee. we had 8 in house and i slept in my car. greatful i did not have 12 show up. Hi Daniel, maybe you missed that the two sofas in our living room recline to make two additional full sized beds and we provide linens for them? Otherwise, just as is accurately shown in our listing, we have three separate bedrooms each have a queen sized bed (we estimate two per person so that should sleep 6). Further, we have two full size sofa beds in the living room (so another 2-4 per bed depending on what the guest wants to do). Even further, we provide a double-tall, queen-sized air mattress to blow up in the living room for an additional two. We believe that this was all listed accurately and clearly in our listing, and are happy to answer any questions any potential guest may have. We are very responsive during your stay also. All was good and family liked being together and cooking instead of Hotel. I recommend to other travelers!! Thanks so much! We really enjoyed hosting you and hope to see you again. It would have been nice to know that the place was in a not so nice neighborhood before we booked. The place was renovated but done on the cheap. The beds were great, but all of the other furniture was cheap and uncomfortable. The backyard space was not useable. There was food left in the refrigerator when we arrived and construction equipment in the garage. I also saw a few bugs. The attached property had questionable tenants. It is hard to immediately fix the neighborhood, but the other things mentioned need some immediate attention before I would consider coming again. We stayed in this unit for 6 days and thank god we weren't there a lot. We took all of our valuables with us everyday. We provide guests with the address of our home and suggest they take a virtual walk down the street using Google Maps. While everyone’s standards vary and some may prefer a commercial hotel experience over a residential experience, our guests find that our neighborhood is tucked just off the main highways but away from traffic. During the afternoon it is common to see children playing in the front yards of the condos together because many young families live in the area. While two homes on the street need to be resided, many homes have been recently renovated. Oklahoma has very hot summers and some may find it too hot outside for comfort. Our photos are extremely accurate and show we selected trendy and new furniture. We often leave non-perishable grocery items left from past guests as a pay-it-forward for future guests. Please ask us if you have any questions.